Popping Champagne bottles may be everyone’s idea of a perfect celebration. But the whole idea of home-cooked meals and family dinners doesn’t have to be as expensive as most people think. UK’s leading wine connoisseur Oz Clarke thinks Prosecco is such a good alternative to Champagnes. You can get as much fun out of a bottle of Prosecco as you can out of a bottle of Champagne, and you save yourself two-thirds of the money. It’s just a delightful wine. Have fun adding in Champagne Alternatives to your kitchen creations. We have put together a few food ideas – Sparkling Cranberry Sauce, Prosecco Glaze, and the beautiful Pink Port Punch. Goat cheese and cranberry sauce not only complements each other’s’ taste, but also looks so good when served together. So after caramelizing sugar on the pan, add fresh cranberries to the pot and wait until it thickens. But the secret to a fruitier, tarter sauce is adding champagne or a sparkling Prosecco to the mix until it boils. Incorporating roast figs or honey to the sauce will add dimension to it, which would taste good with your turkey. From one sweet delight to another, Prosecco glaze is another option to incorporate this wine to simple baked goods. Slowly beating confectioners’ sugar with Prosecco on a bowl will create a glaze that’s thick yet reduced enough to be poured. Spread the glaze on top of cakes, donuts, pretzels or muffins. What better way to appreciate wines than drink it as is – or make Prosecco cocktails that everybody enjoys. 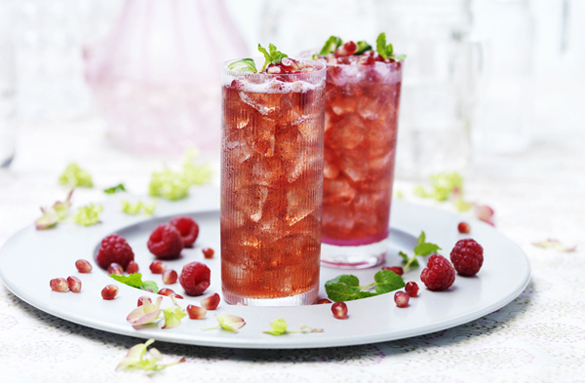 This idea, posted on Marks & Spencer, uses 2 parts Pink Port, 2 parts M&S Prosecco, 2 parts lemonade and 1 part Pomegranate juice drink. Reinventing these recipes with Prosecco is a treat on its own but putting your own spin creates a hearty meal that’s fit for your family and friends.